Remember that classic TV show, Who Wants to be a Millionaire? Did you always want to be on it to get a chance to win the grand prize of a million pounds? Well, here’s your chance now! There is now a Slingo variation of this quiz show and it is called – you guessed it! – Slingo Who Wants to be a Millionaire! This game takes Slingo to an all new level. It combines Slingo, instant wins and an iconic TV show all into one mega-exciting new game. All key aspects of the original TV show have been recreated in this game – including the soundtrack of the show. You can use your Slingo login to play the game on the original website, or you can play this game on other casino websites. Overview of the Game: The lay out of the game has a classic Slingo feel to it, with the familiar 5x5 bingo grid in the centre and the slot reels below it. You need to match the numbers in the reels to the grid and cross them off to complete a Slingo. You will have 9 balls (or spins) in which to get a full house and win the massive jackpot this game offers. How to Play the Game: You will need to set your stake before you start the game. You have 6 betting options: £1 to £5 or £10 Now, simply press the START button and you are on your way! Winning in the Slingo game: When you complete a Slingo, you get a randomly chosen symbol. You are awarded pay outs when you complete these symbol collections. There are fields on the sides of the reels which have question marks in them. Those are where the symbols will appear. The worth of those symbols will depend on the value of your bet. If you complete all the symbols once you have a Full House, you can win as much as £100,000! And if you want to win that massive £1 million jackpot, you need to achieve a Full House in 7 spins! If you run out of spins, you can buy an unlimited number of spins to continue the game till you hit that Full House you are looking for. But remember, for that million-pound jackpot, 7 spins is all you will get! Slingo Who Wants to be a Millionaire is awash with special symbols, from the classic Slingo symbols as well as those special symbols from the TV show. The Joker: When you get a Joker, you can mark off any number in the column the grid where the joker appears. The Free Spin: You can get free spins during the game, which will be used after you finish the 9 initial spins you were allotted. With a theoretical RTP of 95.9%, this is a game that allows you to win more than the other Slingo games. 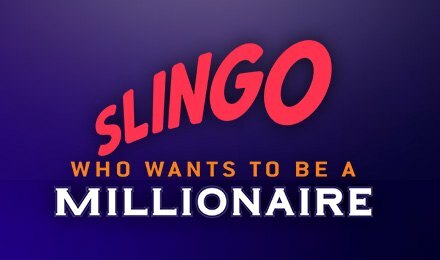 Slingo Who Wants to be a Millionaire does not really have any Slingo bonus rounds, but the gameplay is so exciting that it more than makes up for that. Slingo jokers will mark off numbers on the 5x5 grid. If you can mark off 5 numbers in a row you'll get a Slingo!